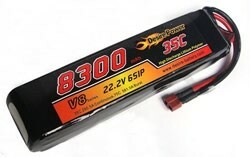 This Desire Power 6 Cell 6S 8300 mAh 35C Li-Po battery is from the Desire V8 series is great value for money; it delivers great performance for every day flights & is really good for heavy lift Multi Rotors like the DJI S900 Spreading Wings. The Desire LiPo battery packs are manufactured from carefully chosen individual LiPo cells which have all been tested to have matched voltage and IR before being assembled. The Desire LiPo battery packs are re-checked after an aging process before the final quality inspection is carried out. Only after the Lipo batteries have passed through the strict quality control procedures will it be shipped. The main power leads fitted to each LiPo pack are matched to the maximum discharge current that the LiPo is capable of. The main battery leads come fitted with the XT150 & AS150 style connector; this is a popular choice by many manufacturers. If you need to use any other style of battery connector the XT60 connector can be replaced with one of your choice after delivery. The balance lead used while charging is battery is the XH type; this is a connector that will work with the battery chargers sold by BYOD. Lithium batteries above 100Wh or having any individual cell above 20Wh, cannot be shipped by air. 57 x 49 x 192 mm.